Haruki Murakami and Shigesato Itoi: Let’s Meet in a Dream (Yume de Aimashou) | Yomuka! Let’s Meet in a Dream is a collection of short-short stories (or perhaps short-short-short stories) by Haruki Murakami and Shigesato Itoi, originally published in 1981. The stories range from one to five pages long, although according to Murakami, these are not quite “stories.” Rather, the book is just a collection of random, aimless pieces of light-hearted writing that Murakami and Itoi clearly enjoyed making. Once in a while, someone will bring up Let’s Meet in a Dream and the “collection of dialogues” between Itoi and myself. This, however, is clearly a mistake. Let’s Meet in a Dream is not a dialogue—but what, then, is it? I haven’t been able to find a good answer to this question. Let’s Meet in a Dream is neither a short story collection nor a book of essays, nor is it a miscellaneous mix of assorted manuscripts. In short, I guess it’s a book of enigmas. From its very conception this book has always harbored mysteries. After all, every single chapter title sprawled across the book is written in katakana. 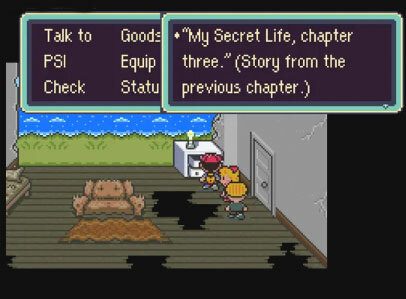 The two of us, Itoi and I, just hammered out these stories, or essays, or whatever, and threw them all together. And now that I think about it it’s an incredibly unique—assertive, even—concept that I can’t quite make any sense of. It’s usually pretty confusing to figure out why we inadvertently write some words in katakana, anyway. But to that end, there exists an underground power plant by the name of Nariyuki (written in katakana), for which this book owes its successful completion and chance to see the light of day. I personally had a great time just working on it fifty-fifty with Shigesato Itoi. The title, Let’s Meet in a Dream, was his brainchild. I’m not quite sure of the exact meaning behind it, either, but maybe it’s just saying, “Read this when you go to bed.” Or maybe it was some attempt between Itoi and I to meet up in some dream. Either way, the book is a complete mystery, from the tip of the title all the way down to the heart of the concept. At the end of each chapter, there’s an “i” for Itoi or an “m” for Murakami. I think you’ll be able to figure us out without looking, though. I was neither a murder suspect, nor a target for an international spy organization. But I drove a car down the Jersey Turnpike at 80 mph…. A police officer pulled me over and asked for my driver’s license. He said I was going 20 mph over the speed limit. I instantly pointed to my wife and said “I’m in a hurry, my wife is in labor.” Fortunately, my wife actually had a big stomach. I hoped he’d let me go with this excuse. “Oh, since it’s an emergency. I’ll lead you to the hospital with my police car,” he said. “Why not?” asked the officer. But a look through both versions of Dream turns up no version of this story. (His recap of the in-game magazine article, of course, is also wrong.) There is also no rumor or even question of the magazine’s origin on the Japanese side of the internet; it’s probably just something Itoi wrote along with the rest of the game script. In length and content it’s totally congruent with the kind of weird short-shorts peppered throughout Let’s Meet in a Dream, but unfortunately this meeting is just a coincidence. 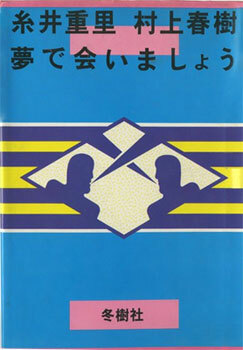 Too bad i can’t read japanese, and even if i could, i can’t find this book anywhere. But thanks for translating these ! Have you read The Legend of Koizumi? Just ordered two copies from my local Japanese bookshop. Strikes me as this same style of humor sorta. To a big fan of Murakami, and a huge fan of Earthbound, this book looks amazing. I desperately want it. Let’s Meet in a Dream: “Coin” by Shigesato Itoi « Yomuka! Let’s Meet in a Dream: “Interview” by Haruki Murakami « Yomuka! Let’s Meet in a Dream: “Death Match” by Shigesato Itoi « Yomuka! Let’s Meet in a Dream: “Sweater” by Shigesato Itoi « Yomuka! Let’s Meet in a Dream: “Jinx” by Shigesato Itoi « Yomuka! Let’s Meet in a Dream: “Pinball” by Haruki Murakami « Yomuka! 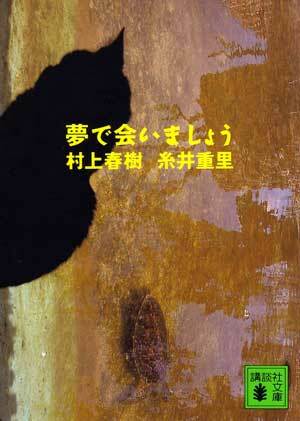 Let’s Meet in a Dream: “Philip Marlowe Part I” by Haruki Murakami « Yomuka! Let’s Meet in a Dream: “Interior” by Shigesato Itoi « Yomuka! Let’s Meet in a Dream: “Straight” by Haruki Murakami « Yomuka! Let’s Meet in a Dream: “Short Stop” by Shigesato Itoi « Yomuka! “Yakult Swallows Poetry Collection” by Haruki Murakami « Yomuka!